Rummaging through the refrigerator at my friends house, I found a few random ingredients I thought I’d throw together in a light, bright salad. Light and bright it was! These ingredients are perfect for what is in season now and if you live in California, you might already have beets and carrots in your garden. Oh, and besides being yummy, this salad packs a nutritional punch! Beets are high in a ton of vitamins including A, B, C, beta carotene, folic acid etc. Carrots are known to help prevent certain types of cancer, and apples keep the doctor away! No, really, they do. They are loaded with so many good things like vitamins C, A, flavonoids and potassium and with smaller amounts of phosphorus, iron and calcium. Not to mention the apple cider vinegar that can prevent kidney stones. This is a true superfood salad! whisk the dressing ingredients together and pour over the rest of the ingredients in a large bowl. Gently toss. 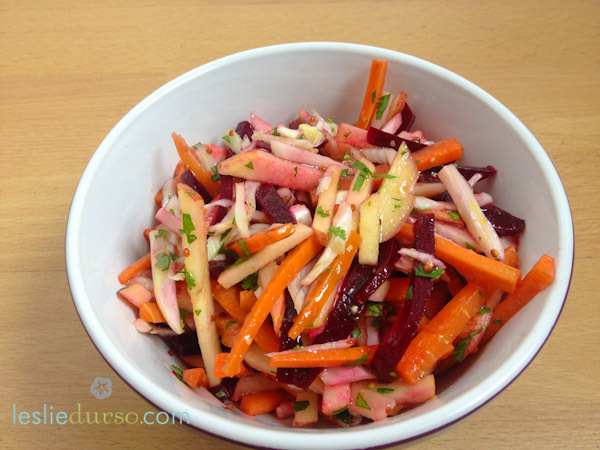 * in order to keep the whole salad from turning pink from the beets, use golden beets instead or mix the salad and dressing together, then gently fold in the beet pieces just before you are going to serve it.